10 Things You Might Not Know About STAR TREK: INSURRECTION | Warped Factor - Words in the Key of Geek. 1. After the huge success of Star Trek: First Contact Paramount Pictures were quick to greenlight a further adventure for The Next Generation crew. Producer Rick Berman came up with various concept ideas. He suggested that Picard could continue his action-Captain style from the previous movie and undertake a daring rescue mission in a similar manner to the 1937 film The Prisoner of Zenda. Another of Berman's ideas would have been very Data-centric and seen the return of Lore, in a movie that he described as being very Wrath of Khan in tone. Berman's final suggestion would see Picard kidnapped and replaced with a surgically modified impostor (this idea ended up being an early inspiration for what would become Nemesis). But Paramount thought quite differently. Reasoning that Star Trek IV: The Voyage Home had been the most financially successful Star Trek movie, up to that point, they suggested that the next film should also be light in tone, and a total contrast to First Contact. 2. Michael Piller was tasked with writing the script, and instantly knew he wanted to give the crew a real feeling of family in this movie. Pillar conceived a 'Fountain of Youth'-type story, which he originally called "Heart of Lightness" but by the time he'd completed the first draft had re-titled it to "Star Trek: Stardust" (the title inspired by a Nat King Cole song Pillar had heard on the radio). Pillar also wanted to include the Romulans as the protagonists, since they had never prominently appeared in a Star Trek film. 3. The first script treatment featured Picard coming face to face with an old Starfleet Academy friend called Hugh Duffy. Duffy had become a renegade who was attempting to provoke a war between the Federation and the Romulan Empire, and Picard would travel to the Neutral Zone to bring him back. Picard eventually finds Duffy and risks his career to help the other officer thwart a plan by the Romulans to take over a planet housing the Fountain of Youth. The climax would see Picard arrested and stripped of his rank by Starfleet due to his actions. Pillar revised his story for a second draft, which would now see Picard choosing to resign from Starfleet himself, feeling he was unable to follow the Prime Directive any longer, but being reinstated by the end. 4. In his role as Associate Producer, Patrick Stewart was sent the second draft. His response was that he felt it would only be suitable for a television episode and nothing more. He felt it lacked the grandeur of a movie, and Paramount felt the same. So Pillar completely revised his story. 5. Under Berman's guidance Pillar was asked to revisit the 'renegade' story-line, but make it a betrayal by a crew-member. Picard would have to deal with this, and with no other option the Captain would be forced to kill the renegade. 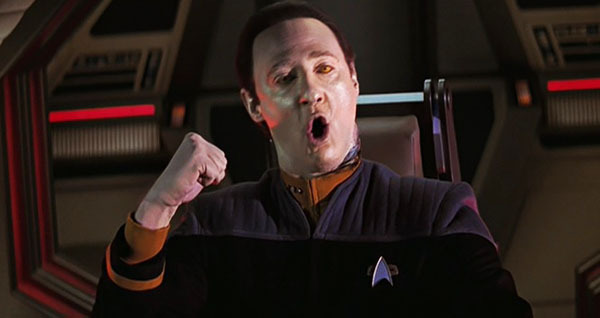 Producer's had briefly considered either 'killing off' or recasting Data at the end of First Contact, but at that time quickly abandoned that idea. However, after hearing a new Star Trek movie was in pre-production Brent Spiner himself asked for his character to be killed off, primarily because he was concerned he was getting too old for the role. It was initially included but, unsurprisingly, Paramount weren't receptive to the idea, and so a further draft saw Picard killing Spiner's Data early in the film, with the android later resurrected to help the Captain in the finale. The reasoning was that if terms couldn't be reached with Spiner to continue in the role, Data's 'consciousness' could be resurrected in a different body. Clearly it didn't happen at all, as further re-writes would remove all these scenes entirely, and when Spiner finally received his copy of the script it came with a note from the production team saying, "Sorry, kill you later". 6. Once again, Jonathan Frakes was signed up to direct early on, but he received very little input during the development process. Frakes wanted John de Lancie to reprise his role as Q, but this never panned out, much to Frakes' disappointment. 7. As well as Heart of Lightness, and Stardust, amongst the many, many titles considered during the scripting stage were Star Trek: Prime Directive, The Directive, The Resignation, The Enemy Within, Breach of Promise, Dereliction of Duty and Apostasy. Neither Pillar or Berman could settle on one title so the final approved script was submitted simply as Star Trek IX. As shooting approached even more titles were considered, including Star Trek: Where Time Stands Still, Star Trek: Forever and Star Trek: Beyond Paradise. Piller later revealed that his favorite was Star Trek: Sacred Honor, but the studio rejected this because they were concerned that it sounded too religious. 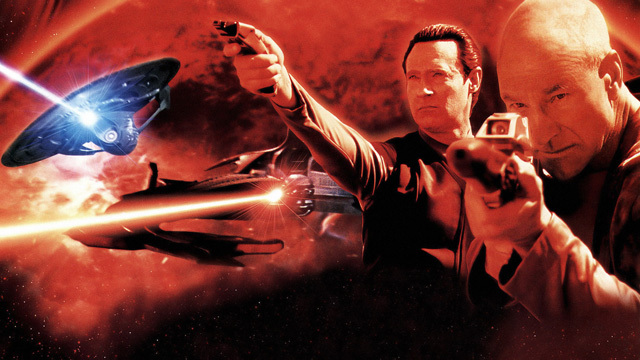 When shooting began, the film was still called Star Trek IX. Paramount's marketing department insisted a title be settled upon, and suggested Star Trek: Revolution, Star Trek: Rebellion, and Star Trek: High Treason. Eventually it was Alan Spencer, creator of 1980s TV comedy Sledge Hammer and a friend of Piller's, who suggested Insurrection. 8. After filming was complete, as usual, test screenings were held. The movie did not test well, with many citing the closing scenes as very disappointing. In the original ending, Ru'afo is ejected into space from the Son'a collector ship and de-ages rapidly as he floats amongst the rings of the planet Ba'ku. A revised ending was filmed which saw the Enterprise swoop in at the last minute to save Picard and destroy the collector ship with Ru'afo aboard. Another area of concern among test audiences was they felt the movie needed a bigger space battle. Paramount agreed, and asked the production team to include one. Unfortunately time was not on their side, and after a request to postpone the release date from Christmas 1998 to February 1999 was nixed, aside from the ending, no further revisions were made to the movie. "It was a studio decision, but still somewhat inexplicable to me as I feel the audience were waiting for some kind of romantic culmination to the relationship, which did happen and was extremely pleasant." 10. Finally, let me leave you with this. Having not seen the finished version of Star Trek: Insurrection, Marina Sirtis later admitted that on her very first viewing, during the film's gala premier no less, she fell asleep half way through!